Hi everyone and welcome to another Terrific Tuesday! 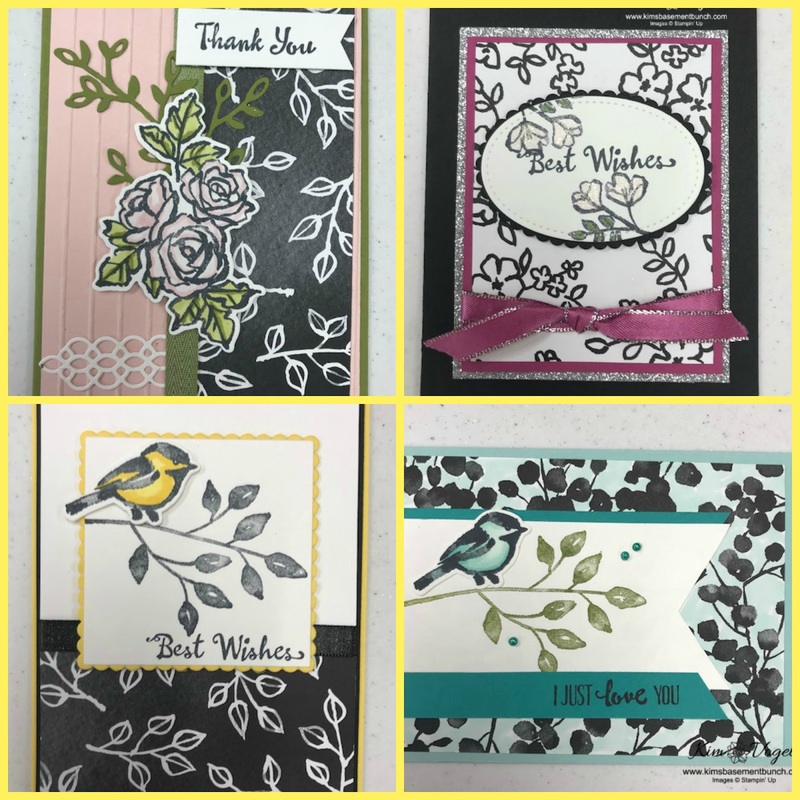 Today I will be sharing a card that I created using the Heartfelt Blooms stampset. I focus more on the different ways to watercolor the flowers from this stampset This stampset is available as a FREE selection during our annual Sale-a-bration event. 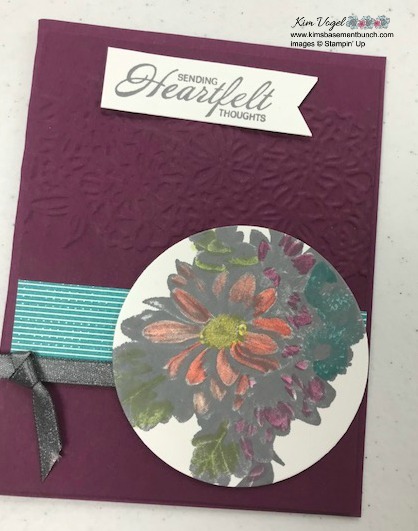 Heartfelt Blooms is hands down my favorite item available in our Sale-a-bration flier. You can probably tell as I used this stampset for last weeks video too! Here is a picture showing the three different watercolor techniques that I demonstrate in my video. 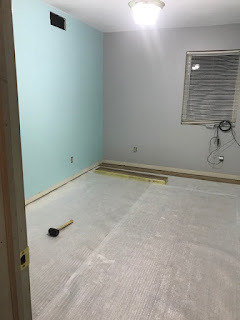 Before I share my video in detail, I thought I would update you all on the progress of our bedroom remodel project for my daughter Natalie. 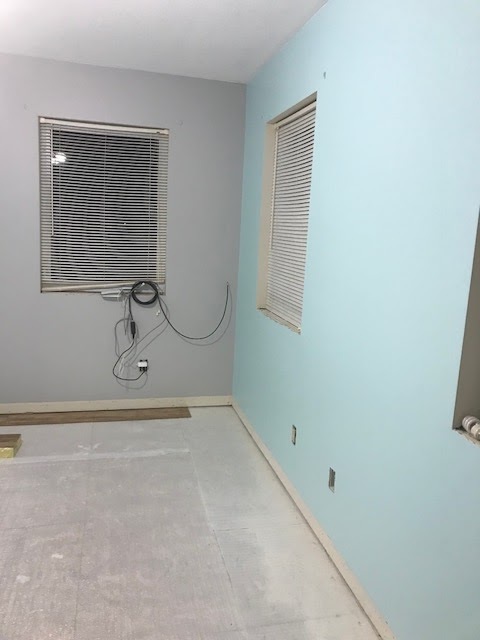 The walls have been painted, she chose some really pretty colors. In Stampin' Up! terms they remind me of Pool Party and Smoky Slate. All we have left to do now is the flooring, which is started, and then to move her in! I will show you all the finished room once we have her moved in and everything in. I send out FREE tutorials on Friday that are EXCLUSIVE TO MY MAILING LIST. Have you checked out my first online class offering this month? Check them out here. I just added the NEW Petal Passion Card Class. This class is yours FREE with a $35 online order, check out the link above for all the details. 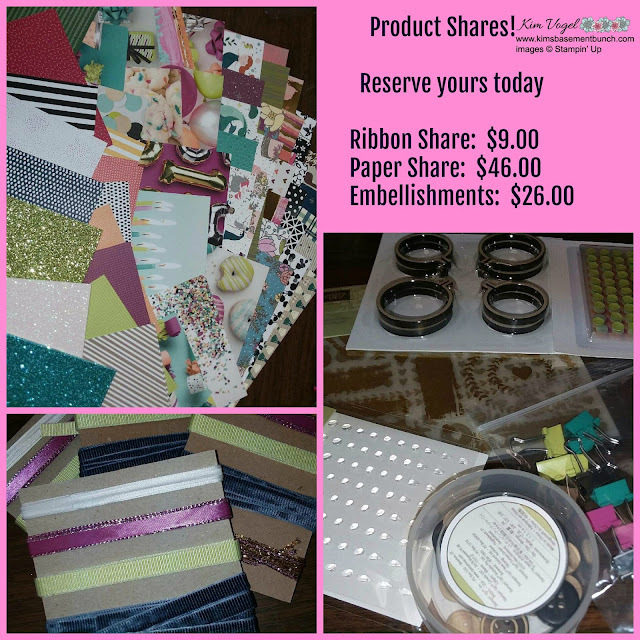 PRODUCT SHARES ANYONE - I am still taking orders for my product shares! I have three different product shares from the Occasions catalog. What is a project share you might ask? It's a great way to get a little bit of all the ribbons, or a little bit of all the embellishments and half packs of all the paper without having to purchase full packs or full bolts of ribbon. I split the product up and you get a little of everything at half or one-third of the cost. Here are the different product shares I am offering. The paper is 1/2 of a pack of every single paper in the Occasions catalog. The ribbon is 2 yards of each ribbon and the embellishments is 1/2 pack of each one! Email me at kim@kimsbasementbunch.com to sign up for 1, 2 or all 3 of these product shares. The cost outlined below is for local pickup ONLY long distance customers will incur a shipping cost. Email me for more details. Here is the video of this week's project. The winner of last weeks pearls is Heather Perry! CONGRATULATIONS Heather! Heather won by simply joining my mailing list! 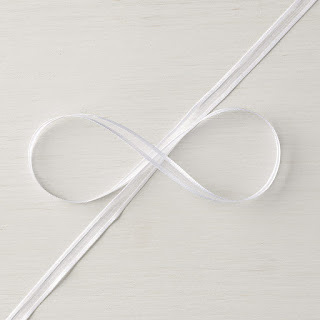 Up for grabs this week is bolt of the beautiful white organza ribbon that is part of the Petal Passion product suite. 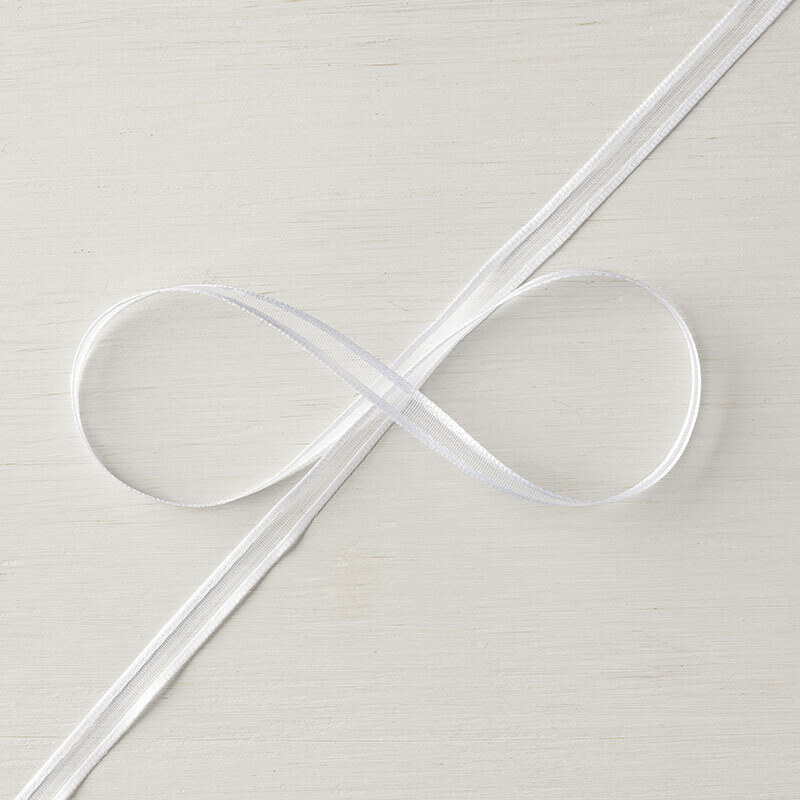 This ribbon is currently not orderable, so wouldn't you like to WIN it! One lucky winner will be announced on my blog next Tuesday so make sure you check back to see if you are a winner. Here is the list of supplies that I used to create this weeks card. Simply click on the supply list at the bottom to place your order.